Whinwell was a Children’s Home in Stirling opened by Miss Annie Croall (1854-1927) in the 1890s. The Stirling Council Archives collection provides an insight into the social conditions and attitudes of the time, as well as revealing segments of the life stories of the individuals connected to Whinwell. Mary Reid was born on 28 Dec 1897 in Causewayhead to parents James and Jane Reid. In 1899, James dies of stomach cancer, leaving Jane pregnant and with two children to care for. In Nov 1899, Jane admits Mary’s brother, James, to Whinwell. The application declares that the mother is not strong and the grandmother is on her deathbed. A letter from a local, Miss Balfour, speaks of the mother having been temporarily separated from her husband before he fell ill and she goes on to comment that “the boy of four is running wild... Of course, the father’s illness was brought on by drink but that is not the child’s fault”. She also claims that the Inspector of the Poor, Mr Morrison, “said she [the mother] was not fit to be trusted to bring up little girls”. However, in a letter written many years later Mr Morrison states “their father was an exceptionally decent man”. Over the following two years, both James and Mary enter and leave Whinwell at the request of their mother. Jane finds work and is keen to keep the children at home but she struggles to control James who often stays out late at night despite his young age. 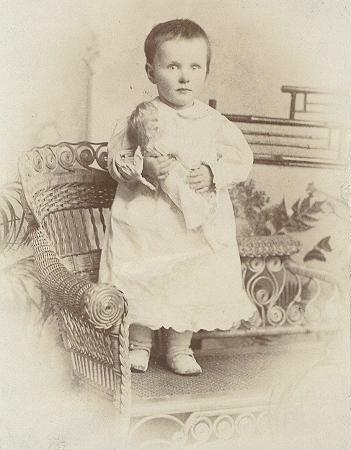 Another child, Isabella Georgina, was born on 26 Feb 1900. By Oct 1901, their case file reads “another child born – father will not own it – no support, nothing coming in, starvation and trouble staring them in the face”. On Sat 19 Oct, Jane hands over James, Mary and Georgina “entirely with no after claim”. The photos below show Mary, aged 4, and Georgina, aged 2. Both photos were taken in 1902 but it is clear the sisters have gone down different paths already. 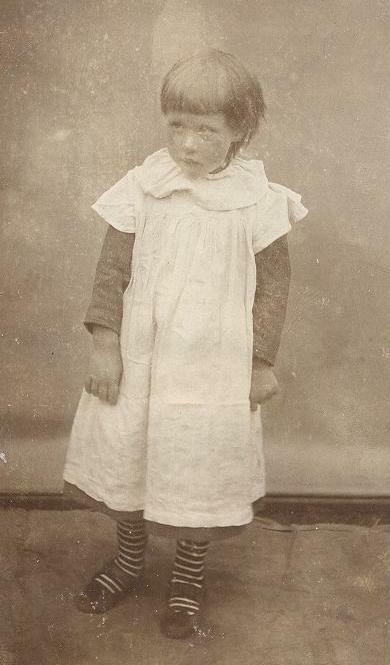 Georgina was adopted on 20 May 1902 by Mr & Mrs Saunders in Liverpool. However, by 1908 she returns to a Children’s Home in Liverpool after Mr Saunders is unable to support her, having lost his wife and being out of work. Less than a year later she is adopted by Mr & Mrs Clarke. Georgina (now known as Isabella or Isa) speaks fondly of Mrs Clarke as a mother to her. Sadly, Mrs Clarke dies in June 1913 and by August Isabella has reported Mr Clarke to the Police for assault. At the court case, Isabella claims “he twice indecently assaulted her but she got away from him and on both occasions he was in drink... Clarke tried to choke her and when the doctor examined her there were marks of it round the neck.” The doctors couldn’t find evidence of indecent assault. Thomas Clarke was fined or to receive two months imprisonment.